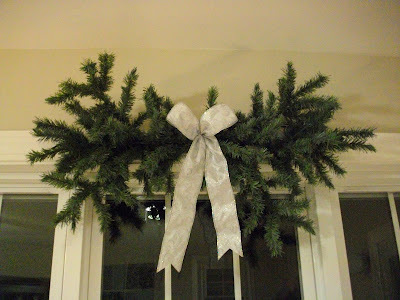 Here are some more decorating pictures and some quick tips to help you out. Remember when I said we bought a new 12 foot tree last year. 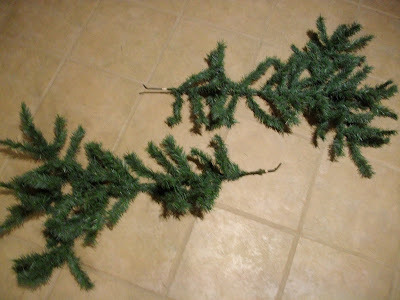 Well, I don't throw anything away, so that big fat 10 foot tree that had seen better days is now morphed itself into different things around the house. Here's the first one. I'll try and post different ideas each day as I take pictures. This swag is just 2 branches from the bottom row of the tree where they are the biggest. 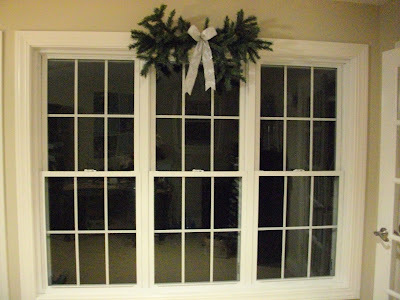 I tap a small nail on the top of the moulding and hang the swag on each window in my sewing room. I leave that tiny nail up all year, so all I have to do is hang it up. 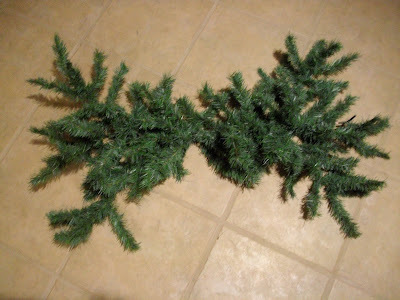 Take 2 branches of your desired size. Face them so the hooks are going in the opposite direction. 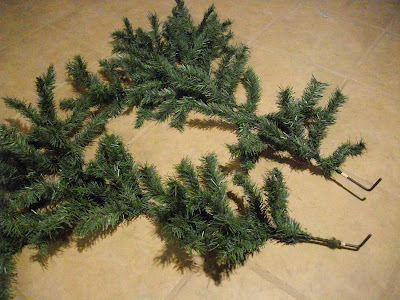 Wire them together with either floral wire or one of the wired branches on the swag. 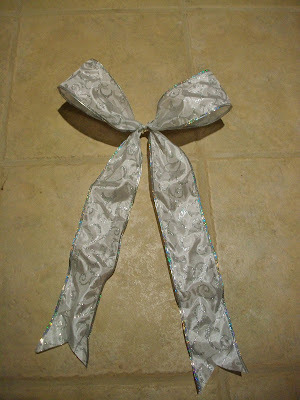 Put on a bow and you're done. 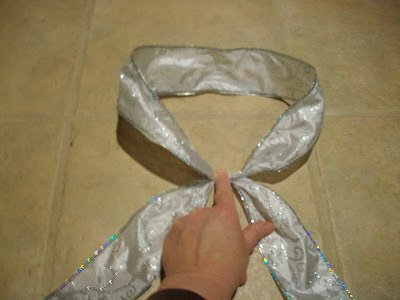 Fold over the ribbon like the shape of the Breast Cancer Awareness ribbons. 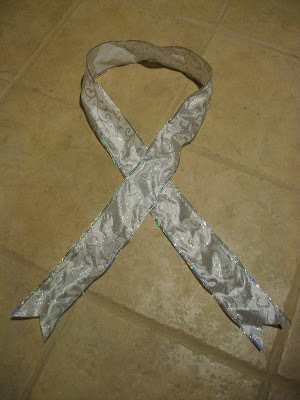 Pinch the part where the ribbons cross. 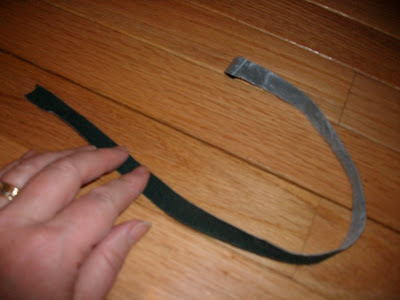 Bring down the center of the top loop and pinch it with the first part. Use wire or a bread twisty and you're done!! This tip is for Jane. She asked how I wire the garland on the railing. I use double sided velcro tape. I think I purchased it in Walmart. 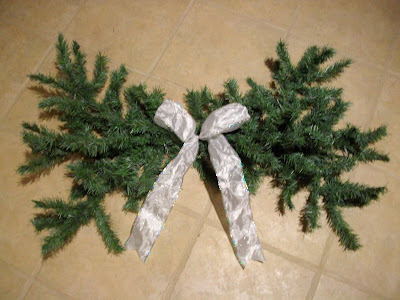 You just wrap it around the railing and the garland and the back side of the velcro tape sticks to the front side of the tape. It's re-usable. I've had this for a long time. Here's a picture of the tape. It comes on a roll, so you can cut it to size. I just put this up last night next to the big tree. There was a big empty space next to it, so I went in the garage and found this old ladder. 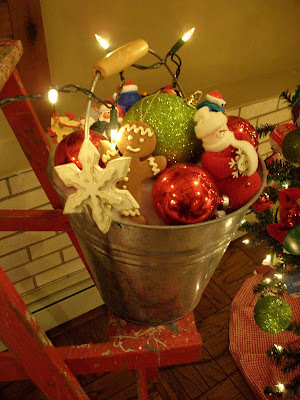 I filled a bucket with some of the ornaments off the tree and I used a small set of 20 lights that I bought at Walmart after Christmas last year for 10 cents!!! I placed a star at the base, so it looks like someone is still decorating the tree, but it fills in the space nicely. This a close-up of the bucket. 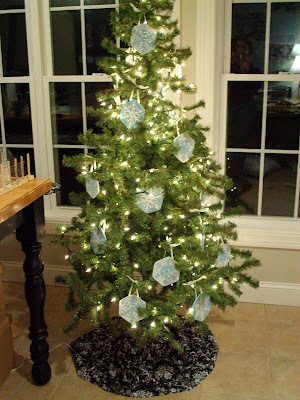 and finally, here is the tree in my sewing room. 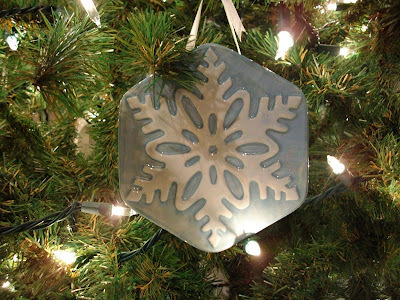 Just simply lights and little porcelain ornament plates that my sister bought me to cheer me up after the flood. They match the room, but even better, they are hexagons...like all the ones I "haven't" sewn in a while for my Grandmother's Flower Garden quilt. I'm off to work...see you tomorrow! I'm linking to The Idea Room...pop over and join the link party!!! Thanks for the tip!! Now off to find it. 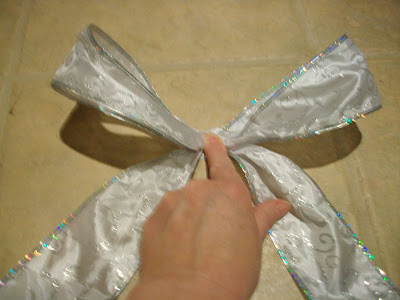 Also, thanks about the bow, I know you think it is simple, but I could never get the fabric the right side up!! Love, love, love the ladder!!!! 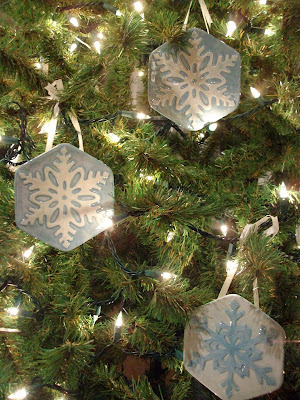 love those ornaments on your sewing room tree. Just love that tree, too! Nice and simple yet stuning. 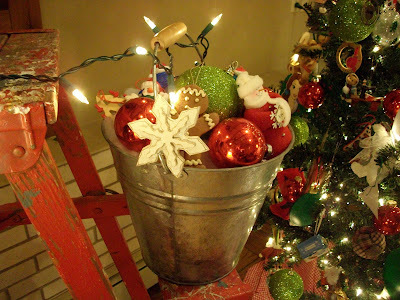 Thank you so much for the re-use idea for the old tree - I've got one downstairs that I now have a wonderful use for! 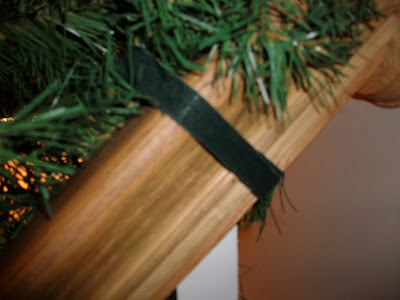 That velcro tip is perfect for decorating the handrail - thanks for that one, too. Now why did I think of velcro!! I decorate a ladder on my front porch in the summer! 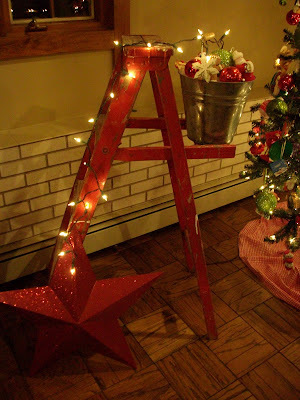 Love ladder decor! !